The inclusion complexes of gemini surfactants, (CnN)2C12 (where n = 12,14), and p-cyclodextrin (p-CD) in aqueous solutions were investigated by an isothermal titration calorimetric method and 1H NMR spectroscopy at 293.15 K. The stability constants, stoichiometry, formation enthalpies, entropies and Gibbs energies for the complexes in aqueous solution have been derived from the calorimetric data. p-CD in aqueous (C12N)2Cl2/(C14N)2Cl2 solutions forms 2:1 mole ratio host-guest complexes. The large values of the stability constants indicate that these complexes are stable in the aqueous solutions. The negative Gibbs energy changes indicate that formation of the host-guest complexes is generally a spontaneous process. Both the formation enthalpy and formation entropy evidently decrease as the number of methylenes in each of the hydrophobic tails increase. The thermodynamic parameters are discussed in the light of the different structures of the host and guest molecules. 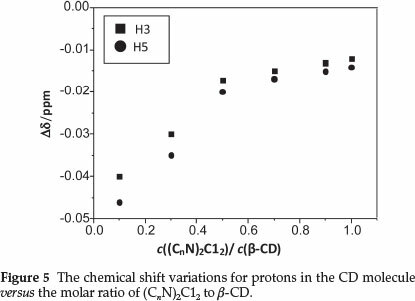 Chemical shift data of protons in the CD molecule, induced by the formation of the complexes have been determined by 1H NMR spectroscopy. Keywords: Gemini surfactant, p-cyclodextrin, isothermal titration calorimetry, 1H NMR. Previous reports studied the interaction between CD and surfactants and focused mainly on systems containing conventional surfactants.5-8 Gemini surfactants were rarely involved. In our work, an isothermal titration calorimeter was used to determine the thermodynamic parameters (stoichiometry, association constant, enthalpy, etc.) for the reaction of gemini surfactants, (CnN)2Cl2(n = 12,14),with ß-cyclodextrinat293.15K.Theresults derived from this study have been examined mainly to obtain information about the variation of thermodynamic quantities with different structures of host and guest molecules. Chemical shift data of protons in the CD molecule, determined by 1H NMR spectroscopy, could provide rather detailed information on the formation of complexes. The experiments were performed in a 201 Nano-Watt Isothermal Titration Calorimeter supplied with a Thermometric 2277 Thermal Activity Monitor (TAM) (Thermometric AB, Sweden). The NMR spectra were obtained with Varian Mercury Plus 400 spectrometer. The /3-CDs were products of Aldrich (purity >99 %). The gemini surfactants were synthesized in our laboratory.22-25 All solutions were prepared with twice-distilled water for the calorimetric experiments. Deuterium oxide (99.9 at.%) was purchased from Beijing Huagong Chang (Beijing, China). Isothermal Titration Calorimeter has a precision for the electrical calibration of better than ±1 %. 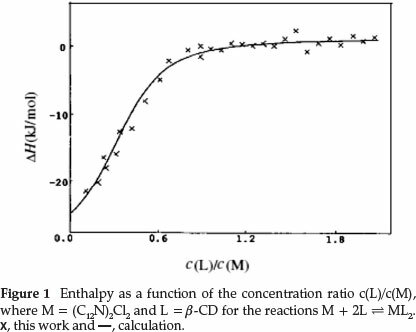 The calorimeter was frequently calibrated electrically during the course of the study and its performance was evaluated by measuring the enthalpy of dilution of a concentrated sucrose solution (0.985 mol dm-3). The resulting value (-0.648 ± 0.012 kJ mol-1) agreed well with the literature value (-0.653 kJ mol-1).26-27 The reference cell of the isothermal titration calorimeter was filled with a fixed amount (2.20 cm3)of twice-distilled water in order to obtain the heat capacity balance of the system. The sample cell (4.00 cm3) was filled with 2.00 cm3 of dilute titrant solution ((CnN)2Cl2 solution, 5.00 x 10-4 mol dm-3) and a 500 ,µL Hamilton burette syringe was filled with the titrant solution (ß 3-CD solution, 5.00 x 10-3 mol dm-3) and was controlled by a 612 Lund Syringe Pump. The titration process consisted of 40 aliquots of 12 ,µL. The interval between two injections was 0.50 to 0.75 h, which was sufficiently long for the signal to return to the baseline. The golden propeller stirrer in the ampoule was rotated at a constant speed of 50 r.p.m. An injection schedule was automatically carried out that was controlled by Digitam 4.1 software after programming the number of injections, the volume of each injection and the time between each injection.28 All experiments were performed at 293.15 ± 0.01 K. The dilution enthalpies of the surfactants and the CD solutions were determined for each titration experiment by using the same number of injections and concentrations as in the titration experiments. No significant effect was found so that the dilution heat was negligible. 1H NMR experiments were carried out in deuterium oxide. The spectra were acquired at 293.15 K. The center of the solvent signal (D2O, at 4.640 ppm) was used as the reference. The proton chemical shifts of ß-CD were determined with the increased concentrations of the surfactants (CnN)2Cl2. The thermodynamic parameters, ∆H°i and K°i, can be calculated by using a regression method,29 which was performed with the Ligand Binding Analysis process using Digitam 4.1 soft-ware.28 We obtained optimum results by comparison of the simulated (calculated) curve with the experimental points.30 The optimum simulated results of the supramolecular systems are shown in Figs. 1 and 2. Thermodynamic parameters for the inclusion complexes are shown in Table 1. The optimum simulated results for the stoichiometry of all (ß-CD-(CnN)2C12) association systems are shown in Table 1. Values of ß2indicate that 2:1 complexes are stable for the (ß-CD+(C12N)2C12/(C14N)2C12) systems. The complexes can be represented by the general molecular formula, (C12N)22+.(CD)m. Since the values of m are all one, it might be believed that the two hydrocarbon tails of a gemini surfactant ion separately interact with the CD molecules, i.e. for the ß-CD+(C12N)2C12/(C14N)2C12 systems, the hydrocarbon chain is sufficiently long that it can coil in the hole of the ß-CD molecules as shown in Fig. 3. The values of the formation enthalpies (∆H0) of the binding complexes listed in Table 1 are all negative. The values are decided by classical hydrophobic interaction, the expulsion of high enthalpy water molecules from the molecular cavity of the cyclodextrin to the bulk solution, and the destruction of the iceberg structure surrounding the hydrophobic chains of the surfactant ion. We mainly notice the change of ∆H0caused by the increase of the number of -CH2- groups in hydrocarbon chains of the gemini surfactant. The apparent enthalpic changes per-mol of ß-CD (∆H°(CD)) are -21.6 and -43.1 kJ mol-1, corresponding to the formation of the most stable complexes (C12N)2Cl2(ß-CD)2 and (C14N)2Cl2(ß-CD)2, respectively. Hence, the longer hydrocarbon chain of the surfactant makes the complex more enthalpically stable. From the thermodynamic formulae, ∆G° = -RTlnß iand T∆S° = ∆H - ∆G°, the standard Gibbs energy (∆G° and entropy (T∆S) changes for the formation of the complexes mentioned above can be derived. The negative Gibbs energy changes (AG°) indicate that formation of the (host + guest) inclusion complexes in aqueous solution is a spontaneous process. The influence of the hydrophobic chain on the thermal effect has been discussed above. In order to elucidate the entropy effect one must consider the microstructures involved. The values of TAS for the formation of the ß -CD+(CnN)2Cl2 complexes are negative and decrease from -6.7 to -50.3 kJ mol-1 as the hydrophobic chain becomes longer. Firstly, the hydrophobic chain of the surfactant can drive water molecules from the hole of the b-CD molecule to the bulk solvent as the inclusion complex is formed. The longer the hydrophobic chain, the more water molecules are driven out from the hole of the CD molecule. This transport of water molecules is an entropy-increasing process. Secondly, collapse of the iceberg structure formed by water molecules around the hydro-phobic chain also causes the entropy to increase31 when the chain combines with the CD molecule. If merely these two entropy-increasing factors were considered, formation of all the complexes would be accompanied by an increase in entropy. However, there is a factor causing entropy to decrease. That is the hydrophobic interaction between the CD and the hydrophobic tail of the surfactant molecule, which confines the freedom of motion of the host and guest molecules, and so causes entropy to decrease. It is the direct (host + guest) interaction that makes the entropy changes of formation of the (ß-CD-(CnN)2C12) complexes negative. Isothermal titration calorimetry was applied to determine the binding constants, stoichiometry, and standard enthalpy, entropy, and Gibbs energy changes for complex formation between gemini surfactants, (CnN)2C12 (where n = 12, 14), and ß-cyclodextrin (ß-CD) in aqueous solution at the temperature of 293.15 K. The systems studied form 2:1 mole ratio host-guest complexes. 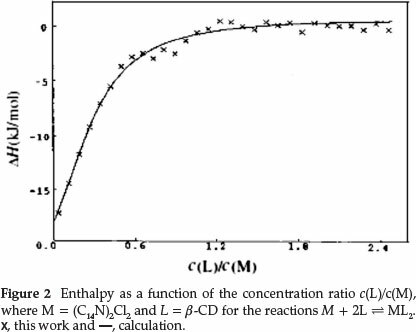 (Enthalpy + entropy) compensation becomes more evident with an increase of the length of the twin hydrophobic chains in the surfactant molecule. NMR chemical shift data have been determined as evidence of formation for the inclusion complexes and to estimate their stoichiometry. The author thanks the Foundation of LYDX2013BS019 and LYDX2013BS018 for financially supporting this work.